If you do not see the booking availability desired, look at my other postings of Whaling Captain's Pierson's Apartment Apartment and Whaling Captain Pierson's Apartment TOO. Or, if your party is larger than the cottage can accommodate consider booking both apartments and the cottage. 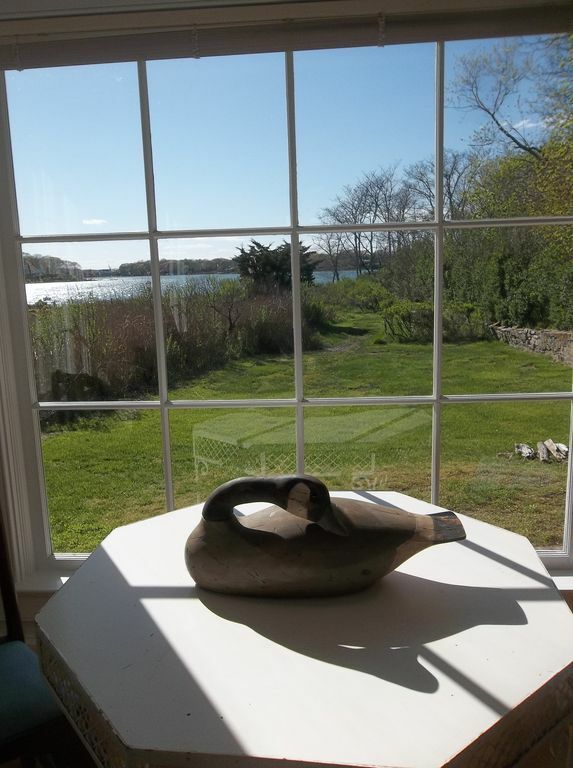 Whaling Captain Pierson's cottage is on Captain’s Row nestled behind the Captain's main house surrounded by nature overlooking the cove. The cottage’s antique furnishings reflect both a classical and whimsical ever evolving sensibility without feeling stuffy, crowded or old. The cottage has one double bed and one single size bed, self-controlled central air cooling and heating, working fireplace, claw-foot tub/shower, kitchen, private beach access, expansive grounds and abundant parking. The cottage is ideal for allowing privacy to loving couples, the single visitor or the various types of creative and performing artists who are looking for a haven to relax and/or create. Experience the cottage and nature or just be part of its inspiring, healing, spirit and soul uplifting surroundings. During the day you may see ducks waddling, bunny rabbits with small white tails scurrying, blue breasted birds frolicking, turtles meandering across the lawn. Also white swan(s), ospreys, ducks or seagulls flying or swimming in Sag Harbor Cove during the day. And at dusk, deer walking through the property after nesting and napping all day. You are free to use any of the various chairs, tables or benches situated on the front lawn and middle lawn. Sag Harbor Cove is also where our private beach behind the property is located for water access to sun-bathing, swimming, sculling, canoeing or fishing if you rent or buy the equipment from one of the specialty shops in the Village. I am most definitely available to give you help throughout your stay. You will be able to reach me by a cellphone call to my listed number with Homeaway/VRBO and/or email. If you have a car or rent one, there is plenty of parking available on the street along the property. Sag Harbor is a vibrant year-round village with plenty of activities both cultural and family oriented alike. There is a performing arts theater, gym and spas, yoga studios, art exhibits, festivals and parades which occur throughout the year. There is also a variety of antique, clothing and novelty shops as well as many fine restaurants, bars and local beaches. Sag Harbor can be reached in 2 hours by car from New York City, the Hampton Jitney or the Long Island Rail Road. The Hampton Jitney stops in the center of the Village of Sag Harbor. The Long Island Rail Road’s Bridgehampton station is 15 minutes to and from the cottage by taxi or car. Additionally, we have 4 bicycles you can use to explore more of Sag Harbor and other surrounding areas not necessarily within walking distances. The proximity to the center of the Village, beach access and amazing sunsets. The cottage is charming with a beautiful view. Walkable to downtown and Paris was very helpful if we had any questions. Beautiful cottage, wonderfully decorated. Spent a relaxing 3 days over Christmas enjoying gorgeous sunsets, quiet walks, and cozy fires. Great to meet you, Paris & thanks for the lovely hospitality! Beautiful cottage with antiques and found objects. Soothing view of water. Very quiet and private. Kitchenette available for cooking. Comfortable spool bed and day bed. Walking distance to town, restaurants and shops. Lovely views of the water. Tastefully appointed cottage near town. Close to shops and restaurants. Kitchenette and full bath. The bright and wonderfully decorated cottage was a welcome getaway! The view of the water and western light were amazing and I was treated to a beautiful sunset! This cozy cottage encouraged relaxation and inspiration! It was very clean and well appointed. I had a fabulous stay at this unique Sag Harbor retreat. Our stay in Sag Harbor for a wedding and catching up with local friends was made so very special staying in Paris's charming and enchanting cottage on the Sag Harbor Cove. Behind his classic whaler's cottage right on Main Street, the cottage was so perfect and polished. Beautifully decorated, modern decor, gorgeous views of the cove and sunrises/sunsets, very comfortable bed, the sweetest kitchen with modern appliances and a classic clawfoot bathtub for showering or taking a long soak. We absolutely loved the cottage and plan to be back very soon. Paris is such a wonderful and gracious host. We feel honored to have stayed in the cottage and had one of our best visits ever to the historic, whalers port of Sag Harbor. The cottage is just a short walk to Main Street where many wonderful restaurants, shops, museums and local art galleries await. We highly recommend booking Paris's magical cottage for any couple who need a relaxing getaway in a picture perfect setting on the water in your own private cottage. The nearest pond is Otter Pond. The nearest park is Mashashimuet park. Breakfast and lunch can be purchased at the Cove Deli. All of these places are 5 minutes away from the house.